Counting cells that equal to a specific value can be achieved really fast using COUNTIF function. If you need to use multiple criteria you can also use COUNTIFS which allows for more flexibility. Using COUNTIF function is straightforward. All you need to do is define the range where you want to search for the criteria and the criteria. In our case, we want to look at range B7:B17 (named products) and count the number of time burgers were sold. COUNTIF returns the count of values in B7:B17 that are equal to “Burger”. Changing the criteria (cell B2) to “Pizza” will return a different result. 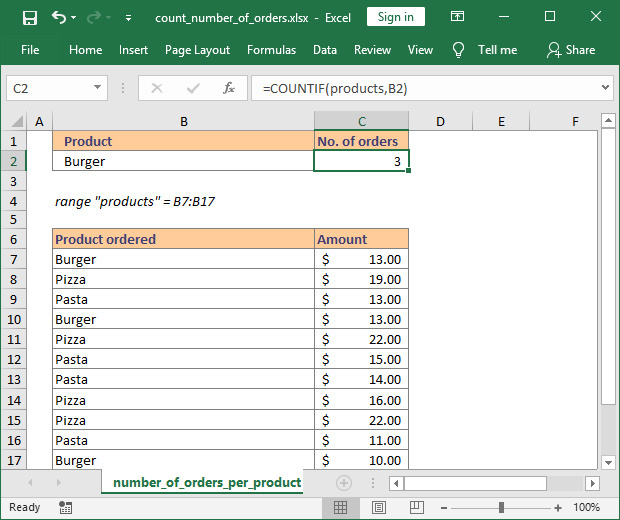 You can download the Excel workbookif you want to take a closer look at this example. Note: when you want to provide the criteria directly as text, you will need to use the double quotes "" in your formula. As an example, the above formula can also be written =COUNTIF(products,"Burger") and it will return the same result.